The first week of the 2019 Australian Open has passed us by and there are so many stories to come out of it as we edge closer to crowning our first Grand Slam champions for the year. 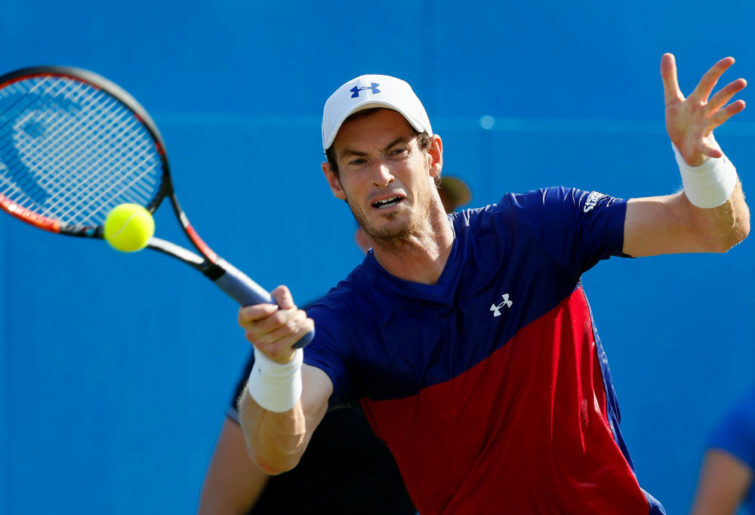 While the top two seeds – Novak Djokovic and Rafael Nadal – have progressed to the round of sixteen, third seed and two-time champion Roger Federer’s bid for a 100th career title and 21st Major will have to wait, while for the other member of tennis’ so-called “Big Four” – Andy Murray – this may have been his Australian Open swansong. 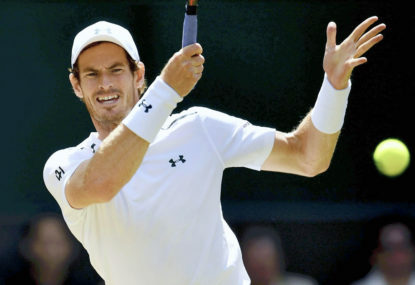 It is just over a week since Murray announced that he would retire following Wimbledon, but whether he will even make it to the All England Club will remain to be seen, the Scot having been troubled by a hip injury over the past 18 months which at one point saw his ranking plummet into the 800s. The 31-year-old bid farewell to Melbourne Park on Monday night following a tough five-set loss to Spanish 22nd seed Roberto Bautista-Agut, who subsequently won two more five-setters (against John Millman and Marin Cilic) to reach his first Grand Slam quarter-final, where he will face Greek sensation Stefanos Tsitsipas, who has also gone this far at a Major for the first time. The Scot fell behind by two sets to love but defied his weakening body to take the next two sets and force a one-set shootout – but the task became too much as he crashed to his earliest Australian Open exit since 2008, when he lost his first match to the eventual finalist, Jo-Wilfried Tsonga. He leaves behind some unwanted history, being the only man to have lost five Australian Open finals (one to Federer and four to Djokovic). Still, he managed to build an impressive record Down Under, and could have won one or two titles had he not had to face either man in his five finals here. Tsitsipas, for his part, has shown why he is one of the up-and-comers in men’s tennis, upsetting Federer to become the first Greek player – male or female – to reach the quarter-finals of a Grand Slam tournament. After dropping the first set in a tiebreak, the 20-year-old raised his game a notch, taking the second in a tiebreak and breaking the Swiss at the death in the third to go up by two sets to one. He then had the advantage of serving in every odd game in the fourth, meaning he could keep the 37-year-old on the back foot. 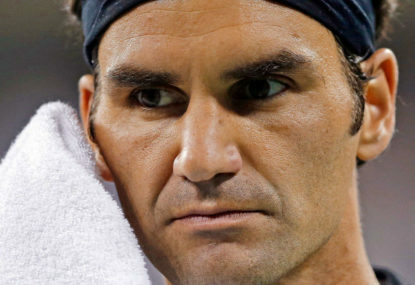 However, Federer would hold his nerve in the tenth and twelfth games to force a tiebreak. Tsitsipas dominated proceedings, winning the first three points before Federer pegged it back to 3-all. Shortly after, the 14th seed raised a match point, and emerged victorious after Federer netted a backhand to end the contest after nearly four hours. 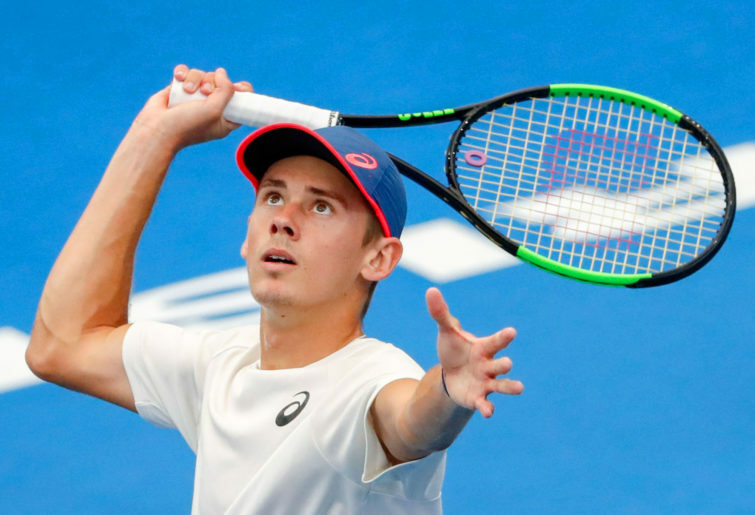 While Bernard Tomic and Nick Kyrgios continue to be mired in controversy, three other Aussies – Alex de Minaur, Alex Bolt and Alexei Popyrin – provided fans with reason to cheer and believe that the future for tennis in this country is bright. While the scoreline might suggest otherwise, de Minaur made Nadal work hard for his 6-1, 6-2, 6-4 victory – which was the exact same scoreline when the pair met at Wimbledon last year. 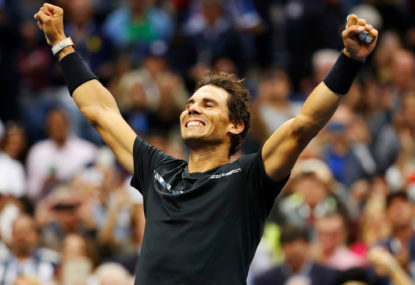 The fact that the first three games of the match lasted twenty minutes, and that Nadal needed five or six match points to close it out was testament to de Minaur’s determination not to give up in the face of such adversity. 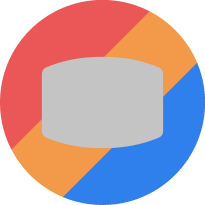 Meantime, Popyrin, the 2017 junior French Open champion, pushed Frenchman Lucas Pouille to five sets, sadly surrendering just after 12:30am local time, while Bolt gave a good account of himself in a straight-sets loss to fourth seed Alexander Zverev. 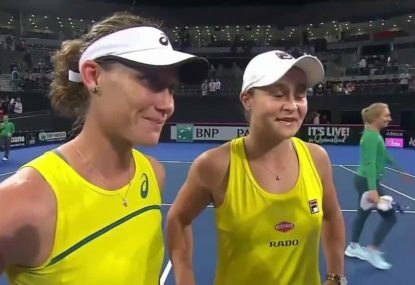 On the women’s side, all the talk is about Ashleigh Barty, who has become the first local woman in a decade to reach the quarter-finals of the Australian Open. The 22-year-old came from a set down to defeat 2008 champion Maria Sharapova in three and advance to her first Grand Slam quarter-final, where she will meet eighth seed Petra Kvitova, who only recently defeated her in the Sydney International final over a week ago. It was the same Sharapova who had produced her best performance in her comeback from a 15-month doping suspension to end the title defence of Caroline Wozniacki in the previous round, breaking midway through the final set to take victory over the Dane. Barty will have her work cut out if she is to extend her run into the semi-finals – the left-handed Czech has not dropped a set in her four matches so far and didn’t face a single break point in her 59-minute dismissal of American teen sensation Amanda Anisimova on Sunday. Anisimova had made history by becoming the first player, male or female, born this century to reach the fourth round of a Major and was ultra impressive in her third round win over eleventh seed Aryna Sabalenka, whom many had touted as a dark horse for the title. 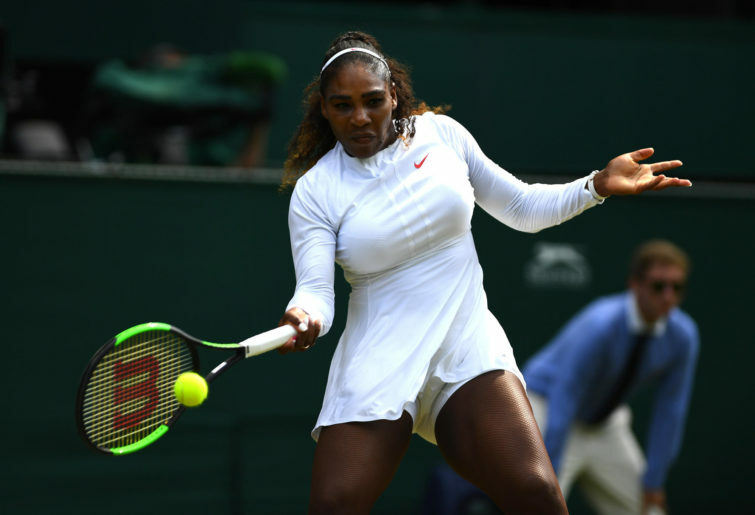 As usual, the top contenders have made it into the second week, with Serena Williams to face a world number one for the first time since 2013 when she comes up against Simona Halep on Rod Laver Arena tonight. The last time Williams faced a reigning world number one, she lost to Victoria Azarenka in the final of the 2013 Qatar Open – ironically, the American would replace the Belarussian at the top of the rankings the following day. The 37-year-old American, contesting her first Major tournament since her infamous meltdown in last year’s US Open final, has barely been forced to sweat, losing no more than two games in any of the six sets she has contested so far. However, facing Halep, who eliminated the other Williams sister, Venus, in the third round in straight sets after winning her opening two matches in three sets, will present a genuine challenge for the 23-times Major champion. Serena remains on track to face Naomi Osaka in the semi-finals, in what would be their first meeting since the aforementioned final in New York last September. Just what reception the American will get in the final four, if that match-up eventuates, will remain to be seen. Osaka, for her part, breezed through her opening two matches without any fuss, but then had to display all her fighting qualities to get past 28th seed Hsieh Su-wei in the third round, coming from a set and a break down to reach the fourth round for the second straight year. The 21-year-old is up against Anastasija Sevastova in her fourth round match today, with both players bidding to reach the quarter-finals at the Australian Open for the first time. Meantime, Azarenka’s return to Melbourne Park, where she was twice a champion (in 2012 and 2013), proved to be short-lived as she fell to German Laura Siegemund in three sets. In the press conference that followed, the 29-year-old was visibly upset as she revealed the toll that the custody battle involving her two-year-old son had taken on her in recent years. It is a far cry from the joyful woman we saw earlier this decade, when she won her two titles and was accompanied by her then-boyfriend, musician Redfoo, at the 2014 event. Another player making an unexpected early departure from Australia is second seed and 2016 champion Angelique Kerber, who found herself on the wrong end of a 6-0, 6-2 humiliation at the hands of little-known American Danielle Collins on Sunday. Collins, who upset Wimbledon semi-finalist Julia Goerges in the first round, has now advanced to her first quarter-final where she will face either Sloane Stephens or Anastasia Pavlyuchenkova, who were still to play their fourth round clash at the time this article went to print. History was also made at the Australian Open when Garbine Muguruza and Johanna Konta started their second-round contest at 12:30am on the Friday morning – the late start made possible thanks to rain which plagued several days of the first week. This came twelve months after the previous latest start to any match at Melbourne Park, when Daria Gavrilova went down to Elise Mertens in the second round with that match starting sometime around midnight. In the end, it was Muguruza who emerged victorious after 3:00am in the morning, and after subsequently defeating Timea Bacsinszky in her third round match, today she faces a major hurdle in her path to the quarter-finals – Karolina Pliskova, against whom she has a 2-7 record against. Pliskova, who is on an eight-match winning streak to start 2019, has required a third set in each of her past two matches to reach the fourth round. And so, the stage is set for what should be a thrilling finish to the 2019 Australian Open, with several questions to be asked, such as whether Serena Williams can equal Margaret Court’s record of 24 Major singles titles, and whether Novak Djokovic can win a record seventh title at Melbourne Park.